Matt Pearson in action during FC Halifax Town's 2-1 win over Barnet at the Shay last season. 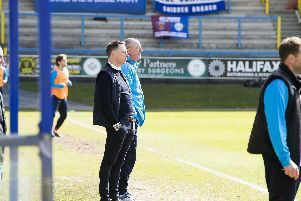 FC Halifax Town could move back into the top-five in the Conference Premier if they can overcome table-toppers Barnet at the Shay on Saturday (3pm). The Bees are eight points clear at the top of the Conference and have the best away record in the division. Barnet have won four more games than any other side in the division and their tally of 70 goals is by far the highest in the league. But they have lost two of their last three games and have won only two of their previous seven away matches. Town could move back into the play-off places if they better Kidderminster’s result against Eastleigh. Should the game go-ahead, it will be the first of five games in the next 15 days for The Shaymen. Town boss Neil Aspin was hoping to have a couple of new signings in place before the game. But Adam Smith isn’t expected to play after picking up an ankle injury at Telford on Tuesday. Town did the double over Barnet last season, winning 2-1 at the Shay thanks to goals from Scott McManus and Lois Maynard before a stunning 4-0 win in London in the return fixture. Follow Halifax Town reporter Tom Scargill on Twitter for live updates throughout every Shaymen match - and check www.halifaxcourier.co.uk/halifaxtown for reports after the game.